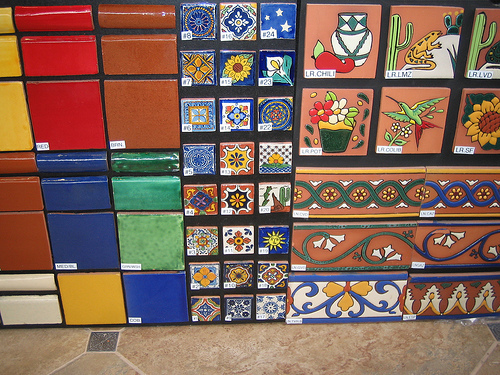 Photo of a retail tile display by deanj/Flickr. Done right, tile ain't cheap. Quality materials and meticulous installation come with a price, but the payoff is a beautiful, nearly indestructible finish that requires very little maintenance and can outlive almost every other material in your home. This applies to everything from humble ceramic tile to premium Italian marble. Not surprisingly, the cost of tile work covers an equally broad range. Figuring out how much your new tile might be involves several factors in addition to the most obvious, the price of the materials. Part of the materials and installation cost of tile work lies in the surface beneath the tile, known as the substrate. Depending on the project and the materials used, the costs may be relatively small, but the substrate is absolutely critical to the long-term success of the installation. In the old days, tile typically was laid into a thick bed of mortar, and this is still done today in some showers and other specialty applications. But now the most common substrate is backerboard installed over the wall framing or the wood subfloor (concrete floors and walls don't need backerboard). There are numerous brands of backerboard and several types of materials, including cementboard, fiber cement, polystyrene and drywall-like gypsum core panels. Every material has its pros and cons, and every installer has their preferences. You can start with a recommendation from your tile supplier (if they're experienced with installation) or tile manufacturer, but in any case, be sure to ask every prospective contractor about what they plan to use for tile backer. The more opinions you hear the more you'll get a sense of the accepted standard for your specific project. If an installer wants to lay your tile directly atop your subflooring, or over standard drywall (or "greenboard") on your shower walls, show him the door. Costs for tile installation vary widely from region to region, but since you'll be working with local suppliers and contractors, the local market rates are your basis for comparison. In other words, if the prices you're finding in Seattle are higher than what folks are paying in Little Rock, you'll have to move to Arkansas to reap those savings. Searching for ballpark installation rates online can get you started, but this info will be more meaningful on a geographically specific forum. With the understanding that market prices vary, you can look online for simple estimates of materials and, most likely, nationally averaged installation rates. A large tile supplier is one place to start. Keep in mind that these types of estimates typically involve very straightforward installations with no bells and whistles. Also, the upper ends of the ranges depend largely on the cost of the tile. If you're thinking about $15-per-square-foot stone tile, you'll likely be way off the charts. A basic estimate should include the backing materials (as applicable), tile, mortar, grout and installation rate. Some calculators provide an allowance for removing the old flooring, and this number can cover a fairly broad range; say, $0.25 to $2.00 per square foot. Some tile jobs are as straightforward as the basic calculators assume, but many are not. Several factors can lead to higher estimates, including the condition of the substrate, the tile pattern and decorative elements of the tile job and the size and type of the tile. Decorative patterns, inlays and accent tiles hike the price of both the material and installation, as will borders and even bullnose (rounded-edge) tiles and base or cove tiles. Very large or very small tile can raise the installation cost. Large-format tiles (anything over 16 x 16 inches), can be especially tricky to get just right and requires a very flat substrate, so make sure your installer has plenty of experience here. Different tile materials come with different installation rates. Generally speaking, ceramic is the cheapest to install, followed by porcelain, stone and glass tile. Specialty materials, such as Saltillo, handmade and metal tiles, are likely to be in the middle and higher end of the range. If you're up for laying the tile yourself, your cost estimate should cover all materials, including backerboard and related supplies, plus all the equipment a contractor uses on a job. You'll probably have to rent a tile saw and will likely buy a trowel for mortar, a grout float, mixing buckets, sponges, caulk and tile sealer. This is assuming you already own basic carpentry tools like a tape measure, drill, level, chalk line, framing square, etc. Finally, there's the little matter of materials delivery, namely for the backerboard and tile. If your ride is a smart car or a bicycle, you'll have to borrow or rent a larger vehicle, so don't forget to add in the rental fee and/or beer money.